She’s in the news – all the time. I wouldn’t want her job, but I envy her lucre. Theresa May like many other British Prime Ministers, is apparently innocuous and ineffectual. They say she’s stubborn and people admire her because she’s a type one diabetic and a woman. She went to Oxford (like they all do it seems, regardless of political persuasion), so obviously she’s qualified for the job. Her unfortunate embroilment in the Brexit caper has tainted her tenure. In the internet age we are no longer subject to constant ‘sound bites’ supplied by the BBC and other broadcasters. There was a time in recent history when anyone could recognise the Prime Minister’s voice -Thatcher really did become tiresome in this respect. But now? We hardly hear the voice of politics unless someone can be bothered to watch live broadcasts from Parliament. It’s all Twitter twatted at us – as if that really matters. Social media has destroyed the ‘live theatre’ element of politics. I don’t care for the British political class or the codswallop they serve up to the public in the name of ‘democracy’. Occasionally I want to do them all violence and one of the best methods to achieve this is not another gunpowder plot – but simply to do a drawing or painting of them. 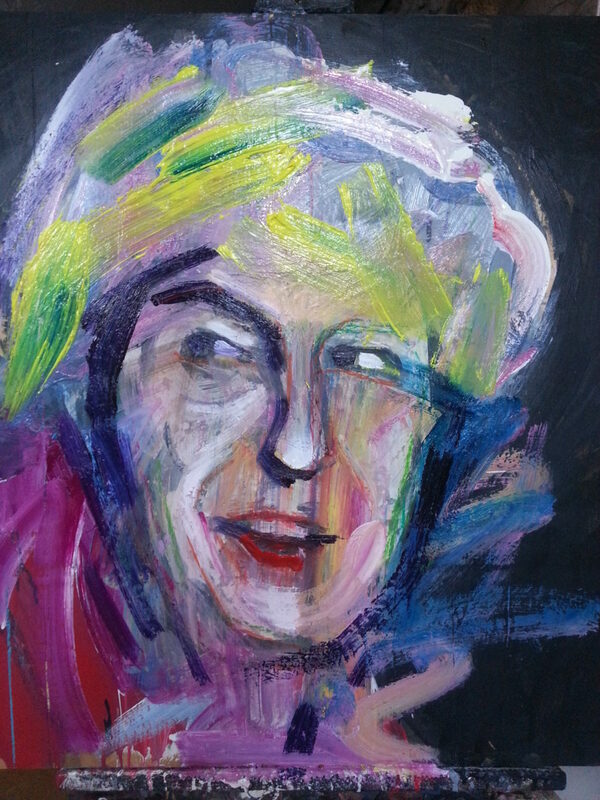 I started on Theresa May about a year ago. Grayson Perry had some ‘genuinely gritty looking’ lino cuts in his ‘Best exhibition ever!!!!!! !’ (Tim Long from St. Martins, did scratchy ‘woodcuts’ into pieces of furniture well before this). I wanted to bring similar awkwardness to an image about Theresa May. So I drew an ugly cartoon of her onto a piece of wooden packaging, then (as is my wont), left it for a year – occasionally pondering what to do. Just recently I decided to do something more, after getting fed-up/stuck on a series of nudes based on tiny pornographic playing cards. I needed to do something big and messy and physical. So I bought a copy of the’Daily Kiss-my-Arse’ (Daily Telegraph), on which Ms. May appeared. 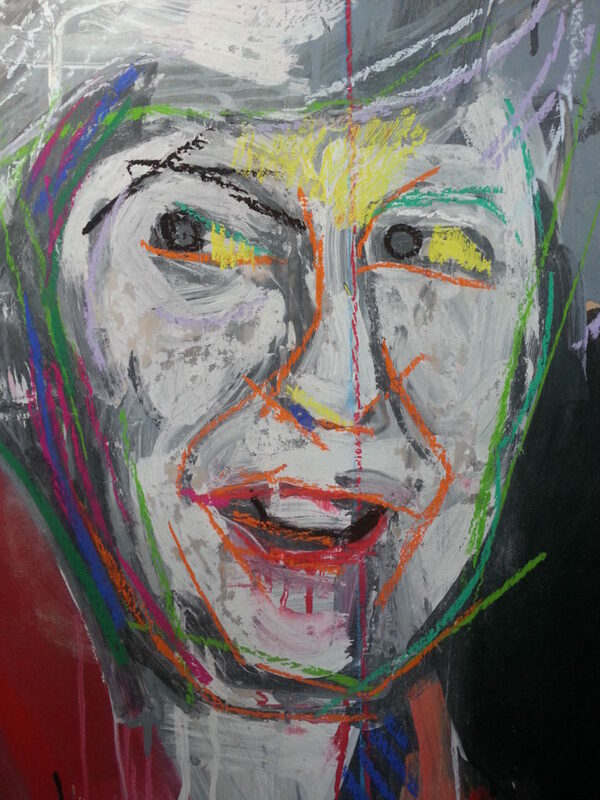 I opened twenty odd tins of household emulsion and attacked the ugly charcoal rendition of our great and glorious leader with filberts, flats and rounds – with complete disdain for tidy, detailed realism. I let it dry and returned with a wire brush, sand-paper and artists soft pastels. After re-asserting a fewpoints of academic drawing, I bought some very cheap hair-spray, fixed the image; then anointed it with matt acrylic gel medium. After which I gave it another good slap about. Applying ‘irrational’ colour, enjoying the nuances of gesture found in the fast drying medium. I like it so far, but will I have the courage to take it further?